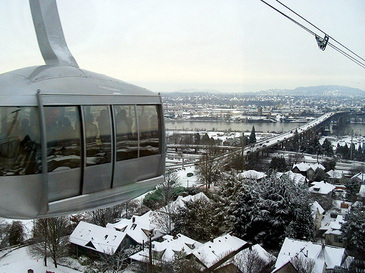 Andy took this photo yesterday as he rode the tram from Pill Hill down to the river and back with his friends. I think I would've liked to have done that, see the city covered in snow from high above. Instead I had a local view: my ever-whitening yard, the feeding frenzy at the bird feeder outside the kitchen window, and my blizzard blanket. We had an unexpected overnight houseguest, which was such a treat, another Pill-Hill colleague stranded by snow here in town. Late last night the three of us and Audrey took a glorious walk through the quiet, snow-covered neighborhood, rosy under the weird snowish night sky. There is a slight incline that runs for about nine blocks up one street of our neighborhood, and there were old-school sledders, head-first on those Rosebud-type sleds, making the long nighttime run at the perfect speed: not too fast, not too slow. Cross-country skiers, other walkers, all of us out at 10 p.m., soaking up every drop of the day. When it snows, I feel real. I feel like I'm part of the year, part of the world. I really, really love it. But then again, I have the luxury of sitting home and working on my blanket with a snowpup at my feet and a cup of chai at hand, so who wouldn't love it, then. The thing is, I'm actually caught up. I'm never caught up, but lately, I have been. Things slowed down and I was, concurrently, able to maintain enough of my speedy inertia to zip it all up at the same time that it slowed down. And here I am, doing a jig called Freedom. 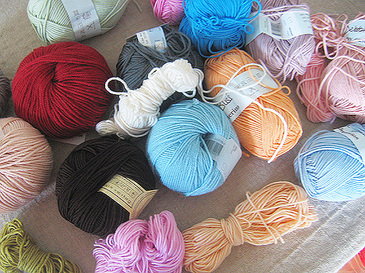 So I jigged over to my yarn stash over the weekend and cleaned it up. I keep my yarn separated in little plastic boxes with cedar blocks. I label them (Worsted Felting Wools, Worsted Cottons, Fancy Cottons, Novelties, DK Cashmerino/Baby, Tweed Wools and Sock Yarns, Other Stuff). I usually keep them all separated like this but over the year they get all messed up so every once in a while I go through them and figure it out again. 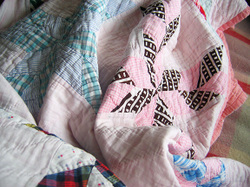 You may remember my brilliant (ahem) idea to crochet a patchwork blanket last spring. I haven't worked on it at all since then. I think I have six or seven squares. Somewhere around the sixth square I remember feeling strongly that I was dreading sewing it all together, but I was too far in to turn back. After I cleaned up the yarn, I thought, "Okay, now the reward: Crochet. Where's that blanket." I looked everywhere for the blanket. I couldn't find the blanket. I seem to have a special Alicia-gift for losing those. Do not ever ask me to "watch" your blanket for you because I will immediately lose it. It's unbelievable. I started to get all hot and bothered. I looked everywhere I thought it could be. I couldn't find it. The day was unraveling. Then I remembered Jane's blanket, the one I really wanted. (Please note: For those looking for the pattern for this blanket, it's Soft Waves from Jan Eaton's book 200 Ripple Stitches, and copyrighted, so please don't ask me to copy it for you. We must support our designers, so they can continue to inspire us.) Perhaps I had "lost" the other one on purpose? . . . Nooooo. Yes? 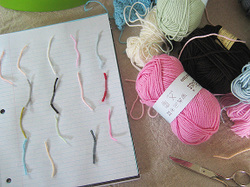 I took the entire box of Baby Cashmerino and other yarns of roughly the same weight and cut little pieces of them and taped them to my notebook so I could see what colors I had. I had a lot. If anyone is in need of a serious stash-busting project, it's me. But I knew it would have to get worse before it got better: I headed out the the LYS and picked up a few more colors I thought would help. I was going for something not-too insipid, something with a bit of clash (you know, to honor the long and illustrious history of clashing colors in ripple-crochet afghans, now all pilled, scuzzy, and strangely appealing [color-wise] at Goodwill now), and something that would go in the living room (green/gray/pink) and the bedroom (aqua/red). 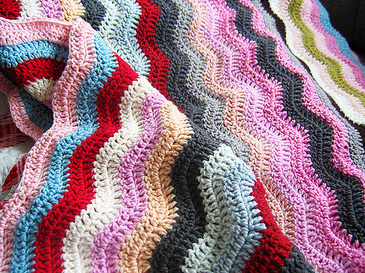 Then I crocheted a few ripples and proceeded to write lengthy emails to Jane first appealing for her forgiveness for totally ripping her off, then discussing the amazing phenomenon of how the blanket changed before my eyes with each added stripe. She knew all about that phenomenon, of course, because Jane and Color are well-acquainted, old friends, confident in each other's talents, familiar with their respective ability to surprise and delight. I'm not so confident or well-acquainted. And when I make things for myself, I almost always use a pattern, or I do, like, super-random, which has the maddening habit of not actually being super-random, but rather sort of . . . unspontaneous and calculated . . . when I do it. But sometimes I don't like to think. I just like to do. I find it a huge relief, to just go go go and not think or worry, just trust. Can you see how the stripes are following the chart? The pattern of stitches is interesting enough to be motivating and not too challenging, but the real motivation comes in seeing how each stripe changes the whole. Even though I've got the chart, there is enough variation in how the colors are different from their paper representations as to be very motivating. At least to me. I find these things enormously exciting. That is why some people find me unbelievably nerdy. I mostly find myself unbelievably nerdy. But I do love it so. All day I sat and watched the snow, and added color after color after color, impatiently waiting to see what would happen next. Jane told me, interestingly I think, that the ripples work on the colors quite differently than straight stripes do. That hadn't occurred to me at all, but I think she's so right. They really are sort of groovin'. Aside from the super-bonus of not having to stitch anything together, or weave in any ends (I just crochet right over the tails left over from every color change), I love the sort of old-fashionedness of this stitch pattern combined with (what I like to think is) a sassily modern color-combo and nice yarn. (I would recommend making this a true "stash" blanket if you do it, because I'm afraid the cost of buying all the yarn at once would send me right back out the door into the cold — I made this a bit over 60 inches wide which is . 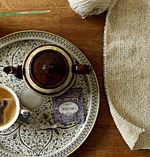 . . really wide, and at this width it takes about 125 yards to get just over TWO stripes.) But I haven't been this obsessed with a project in a long time. Since our snow and my car don't look like they're going anywhere for a while, it seems that I might be lucky enough to have another day of blissed-out ripple-making once again. It's like doing a little jig while seated comfortably on the couch. Gorgeous! It makes me want to crochet. But I would have to go buy it all, so there's a big nope for me. I love birds-eye views. Looking down on a snowy city must be cool. Sledding! I have some great memories of sledding when I was little. Now I think my poor adult body wouldn't take the excitement. The blanket is really beautiful. 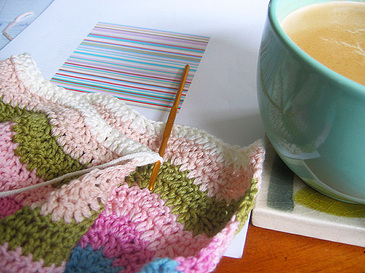 I can imagine sitting and getting lost in the ease of making such a blanket. I also imagine me trying to make this at home and having to work around the small dog that would be in my lap just so he could snuggle under the new blanket that I'm sure he would think was being made just for him! Oh my, this brings back memories! I made 10, yes 10 ripple afgans for Christmas presents about 25 years ago. I've never made another one since. Now, you've got me jonesin' to make one for myself. Like..... I need another project! Wow. That was fast. It looks brilliant - I really love the whole thing so far. 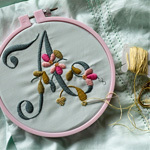 Gorgeous and inspiring, but there is NO way I'd get it done as fast! Wow, it was fascinating to see the process leading to this blanket. It looks of course absolutely gorgeous and I can understand being fascinated by how the blanket changes with each stripe. You must be a fast crocheter - I never learned how to hold the hook properly, I learned by myself from books, and am very slow - making a blanket like this would take me 10 years. And I'm so envious about being caught up - it must be a wonderful feeling! In your own words, GORGE! your words always put a spell on me. here i am, at work, eating pb & j...and then ...snow covered quiet and then beauty in waves of color. thank you for my daily dose of 'get-away'! Ooohhh! How pretty. I want to learn how to do that! How beautiful! I don't have that much in my stash, but seeing your blanket has made me want to buy those grab bags of leftover yarn that you see at thrift stores, just so I can start a blanket like yours. The waves of colour on that blanket are just perfect, it's so beautiful. Whenever I sit down to try to teach myself to crochet two young boys unravel it all faster than I can make it.... I guess they will grow up sometime soon so I shouldn't wish it away! That is beautiful! And so different from Jane's! Wow, maybe a little crochet-along on this one! No snow, here,though (yet). Looks like your little daydream w/the fire and tea etc.. is coming true! Lovely blank-y..enjoy the snow! what a great blanket! i've been crocheting a blanket that's 200 stitches as well. it's much darker (i'll send you a picture) and it's just straight SC all the way back and forth...back and forth and so as you can imagine, it's taking me a while to finish. i get distracted by other, more "exciting" projects like hats and socks and pillows and all kinds of other craziness. 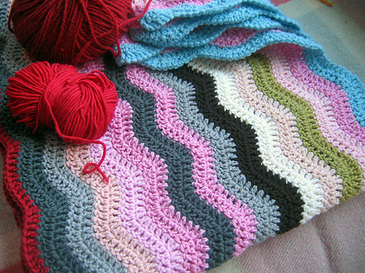 i love your colors though and now i'm totally going to make a wavey blanket (smaller though. maybe just for me.) in bright colors. Great work! Oh and I'm totally going to use that random stripe maker. Neat! Love the blanket! I started a stash crochet blanet, but It's of large granny squares. I don't particularly like granny squares, but they too are addicting! what a funny coincidence, i was looking through your blog just the other day and wondered what had happened to that blanket, thanks for putting my mind at rest! What a fabulous way to spend the day. It really is developing nicely- I can't wait to see the whole. I so love the look of crochet. oh I do love that blanket!!! and the stripe genreator is just marvy! i could play with it all day!